For corrosive atmospheres and fiuids, resistant to high dynamic presure loads and vibrations. Well suited for the process industry applications inluding: Petrochemical, Chemical plants, and energy etc. 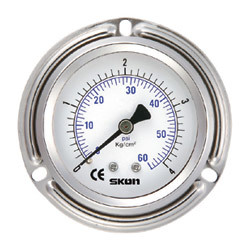 3.Pressure range: -1/0 to -1/+20 kg/cm² (bar), 0/1 to 0/1000 kg/cm² (bar). 4. Operating temperature: working temperature -max: 100℃, ambient: -20℃ ～60℃. 5. Connection: aisi 316, lm/lbm/cbm. 6. Connector size: 14mm 1/4’’, pt, npt, pf, bsp. 7. Sensing element: bourdon tube, aisi 316, Din 50049(aisi 316 ti), ≦ 70kg/cm² (bar) c, ＞ 70kg/cm² (bar) h.
9. Dial: aluminium alloy, black figures and line on white background. 10. Pointer: aluminium alloy, black painted. 12. Upper ring: aisi 304. 14. Window: normal glass, laminated, safety glass, acrylic. 15. Order options: filling fluids optional, flange(rear or front) , red mark pointer, clamp fixations.